The $1 billion, 97,000-member Partners Federal Credit Union had some high falutin company come by for the grand re-opening of its flagship Orlando branch. 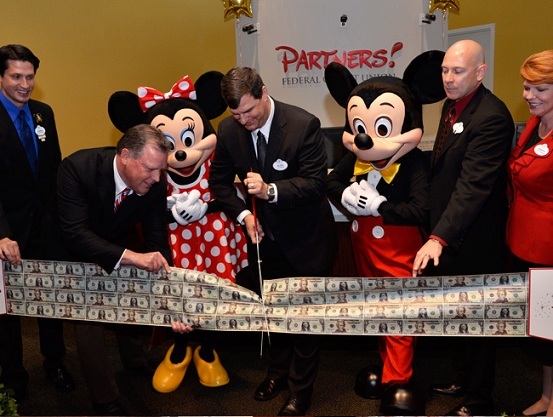 Cutting the ribbon are, from left, Disneyland Resort Ambassador Norman Vossschulte, President/CEO John Janclaes, Minnie Mouse, Partners Board Member Alden Weiss, Mickey Mouse, SVP/Member Services Bill Partin and Disneyland Resort Ambassador Jennifer Mason. The $1 billion, 97,000-member Partners Federal Credit Union had some high falutin’ company come by for the grand re-opening of its flagship branch in Orlando, Fla. The new branch on Buena Vista Drive provides traditional services as well as the Partners Technology Bar, which includes a customized self-service kiosk that includes tablets and smart phones. Partners FCU serves cast and family members of the Walt Disney Co. “We believe our Team Disney Orlando branch allows us to deliver outstanding service in what truly is a unique and exceptional environment,” said Partners President/CEO John Janclaes.